A complete 2-player experience await you. This five-minute strategic combat game springs to life with fantastic artwork and tactical gameplay. Two warriors will enter the arena, but only one will emerge victorious. 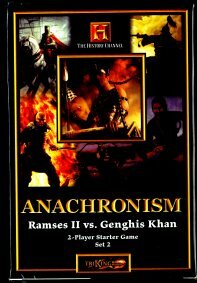 The Anachronism 2-player Starter Game box contains all you need to pit these two great warriors agains each other in single combat - two full sets of warriors and support cards, a play mat including both the arena map and rules of play and two six-sided diece. Your options expand with additional Warrior Packs, each with another warrior and the tools that made them great. Educational and informative cards bring history to life through exciting game-play.